Be careful in using forms from fee-for-service forms providers and document assembly services. Not all, but nearly all pleadings drafted or sold by these services violate Texas Rule of Civil Procedure 190 in their first paragraph and don’t get much better from there. However, whether it is due to financial constraints or other reasons, there is always a healthy supply of self-represented litigants who search for the proper forms to move their case along. As you shop around for legal forms, remember that LOOKS DON'T COUNT. Sure, it's nice to present a beautiful form with a pleasing selection of fonts. But the judges in disctrict court are accustomed to all manner of forms and beauty is the dead last aspect they consider. It is far more important to the judge that her or she be able to quickly determine exactly what it is that you're asking the court to do. A beautiful form that uses the wrong terms or misuses the right terms creates confusion whereas a simple form that meets all the requirements makes it easy for the judge and opposing counsel to know what you want. And if the judge doesn't know what you're asking for, it's impossible for the court to give it to you. "SECTION II: Select the first option if you seek joint managing conservatorship of the children before the court. Select the second option if you are seeking sole managing conservatorship and you meet all the statutory requirements for being appointed sole managing conservator." Really? That's supposed to help? Once you've filled out the form, correctly or incorrectly, you have to file it. The filing instructions provided by paid services are useless. 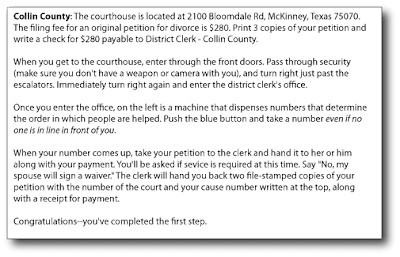 Here's a typical line of instructions: "After you complete your petition, take it to the clerks' office of your local courthouse along with applicable filing fee." In most counties, there are several courthouses. In my home county, Collin County, there are more than I can count. We have the district courthouse, the probate court, a federal court house, county court at law courthouses, JP courts, and multiple municipal courthouses. For most people, "your local courthouse" would be a municipal courthouse--the same place you go to pay traffic tickets. 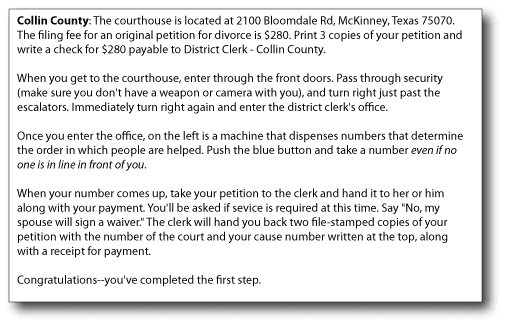 But if you walk in there with a divorce petition, AT BEST you'll be sent away with directions to the district courthouse. At worst, you'll get a shrug and you'll be back on google trying to figure out where to file. Before you pay for forms that fail to follow Texas and local rules and which fail to give you the guidance you need in filling them out and filing them, try some of the excellent sources of free forms available.